You may be familiar with the stats on how teenage drivers from ages 16 to 19 years have 3 times the rate of fatal vehicle collisions as drivers over 20 years of age. The IIHS (Insurance institute for Highway Safety) has some alarming statistics showing that teens from 16 to 17 are the most at risk for being in a automobile crash and that more teen boys are killed in vehicle collisions than teen girls. This is scary to think about especially for parents of teenage children. The top reasons given for this increased collision rate for teenagers is immaturity and inexperience. To combat this, young drivers need to gain more experience driving and in facing the challenges involved with operating a car on the road. This is why we take our job at Top Driver Driving School so seriously, and why we put our all into creating the best driver training program out there. With this experience, teenagers need supervision and guidance from their parents. Parents can better teach their teens excellent driving skills and habits as they understand the main causes for car crashes involving young drivers. Yes, mobile phones, texting, and tweeting are big causes of teens being distracted in the car. However, driving while friends are in the vehicle has been shown to also increase the risk of car collisions. Actually, for each additional car passenger, that risk grows. Most states have implemented graduated driver licensing laws for this reason alone. Parents can: Ensure your teen driver has their cell phone turned off and put away while they are driving. Make it a main household rule of driving. Require a limited amount of peers (one or two at max) in the car unless an adult is driving, or even require no driving with peers for the first one or two years of driving. State laws do not allow teenagers to drink. This does not stop all young people from drinking, though. Thirty three percent of youth from ages 15 to 20 years that were in fatal car crashes in 2009 were drinking alcohol according to the NHTSA (National Highway Traffic Safety Administration). Parents can: Begin talking with your children well before their driving age about underage drinking. Establish your household rule early on about never drinking while driving. Explain and show the risks and dangers. 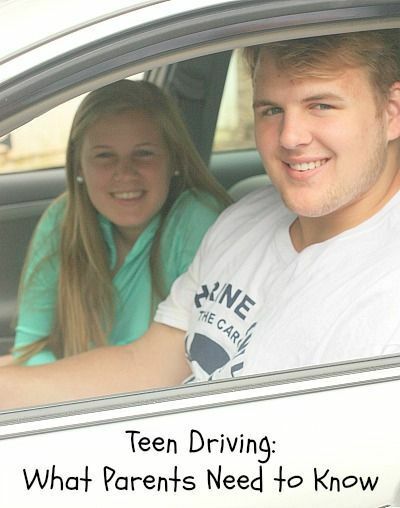 Parents can greatly reduce this risk for their teen drivers by direct involvement, setting a good example, and communication with their kids. Young people have an inclination to take risks. You combine this with the lack of driving experience on how to be a safe driver, and you have two prime causes of teenage car collisions. Lack of experience make young drivers much more prone to be in a car crash due to over-correcting around curves, speeding, driver errors, going too fast for current road conditions, and other driving mistakes. Teen drivers seldom have the skills to see and respond appropriately to hazards on the road. It’s in the very nature of young people to believe they can take a risk and not be hurt. Parents can: Follow the driving laws of your state yourself and set a good example for your teen. This alone will make a bigger impression than what you say to them. Then give your teenager opportunities to drive and gain experience as much as possible before they are allowed to drive by themselves. It’s been recommended by the IIHS and NHTSA to create and enforce your own family driving plan with individual steps to gradually give your child more freedom with driving, instead of simply handing over the car keys when they first get their drivers license. Establish strong family rules for your young drivers, like a “No Tolerance” for speeding, or for drinking alcohol, or for texting while in the car. Remember that teen car crashes aren’t limited to risk taking young men. Kids with excellent grades and who don’t tend to take risks can still make deadly mistakes while driving simply due to the fact that they do not have much experience. This is why it’s imperative for parents to have protective restrictions for young drivers until they have gained more experience. It can save your child’s life, and the lives of others.